Our amazing sea life – sea turtle nesting season! 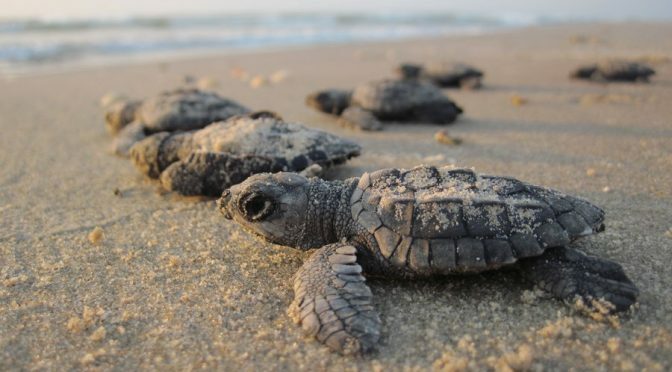 From now through the end of October, three different species of sea turtles will be landing on Florida’s Gulf coast beaches to lay their eggs. You may see mounds of sand on the beaches that are roped off; this is a turtle nest and PLEASE DO NOT TOUCH!!! You may even be lucky enough to see the hatch-lings making their way to the Gulf of Mexico, it is an absolutely amazing site as this VIDEO WILL PROVE! http://bit.ly/turtle_hatching. We can all help in the success rate of these little guys by leaving the beach as natural as possible. Please help us to keep these beautiful creatures safe! !